One area of confusion for diabetics and their diets is carbohydrates. So, should you eat carbohydrates or avoid them? Carbohydrates have a direct influence on blood sugar levels and so diets followed by people with diabetes tend to focus either on the quantity of carbohydrate intake or the speed at which carbohydrates are absorbed by the body. In the UK, patients diagnosed with diabetes are generally recommended by health professionals to follow a low GI diet rather than a low-carb diet. What is a carbohydrate controlled diet? A carbohydrate controlled diet is a diet in which carbohydrate intake is either limited or set at a particular value. Setting carbohydrate intake at set values or limits can be used by people with diabetes help stabilise blood glucose levels. A diet involving fixed intakes of carbohydrate through the day can help to simply diabetes control and may be helpful to people on insulin, and particularly those on fixed dose insulin regimens. Having a fixed intake of carbohydrate each day offers less flexibility in terms of meals but can offer more consistency over blood glucose control. People with type 1 diabetes will still need to have competence in carbohydrate counting. Restricted carbohydrate diets set a limit on how much carbohydrate you take in over the course of a day or for each meal. Low carbohydrate diets are a form of restricted carbohydrate diet. Restricted carbohydrate diets may specify a maximum value of carbohydrate intake. However, sometimes this is not needed, particularly if the diet suggests avoiding many of the kind of foods with higher carbohydrate intakes. How do restricted carbohydrate diets work? Restricting carbohydrates from a diet can help to reduce hunger, particularly in people with diabetes, as it can help prevent wider swings in blood glucose levels that can be responsible for causing hunger. If carbohydrate and calorie intake is kept low enough, it can help to promote regular ketosis in which the body breaks down fat tissues to convert them into ketones, an alternative energy source to glucose. The breaking down of fat is one reason why very low carbohydrate diets can help with weight loss. Whilst restricted carbohydrate diets can help with weight loss, they may also be used primarily for maintaining good blood glucose control. If following a low carbohydrate diet, an increased intake of fat and protein may be needed to prevent weight loss occurring. Are restricted carb diets bad for people with diabetes? As with any diet, it is important that the diet includes a healthy balance of nutrients. People looking to follow a low carbohydrate diet or ketogenic diet are recommended to speak with a dietitian who should be able to help ensure the diet is not deficient in any vital vitamins or minerals. Whilst it is a relatively common view that low carbohydrate diets lack fruit and vegetables, it does not need to be the case, particularly if non-starchy vegetables are chosen and fruits with a lower carbohydrate content such as berries. Now for somebody with diabetes, you're going to have to match that food and the nature of that food - the amount of it, with your insulin. So the more you can understand about how foods are absorbed in your body and get used by your body, and how insulin works, the better you're going to make the two of them balance so that you are nice and fit and healthy for the long term. One of the things you might end up talking to your healthcare professional about is finding out your insulin to carbohydrate ratio. For example, if you have a digestive biscuit – worth 10 grams of carbohydrate or one exchange, you might need just one unit of insulin against that 10 grams of carbohydrate so you've got a 1-to-1 ratio. Other people might need 2 units of insulin for that same 10 grams of carbohydrate. With time and with blood testing and just keeping a note on things, you get to know what your ratios are and they might change through the day. You might need 1-to-1 in the morning, 1-to-1.5 at lunchtime and maybe 2-to-1 in the evening. It's perfectly normal that in the day the body uses up energy on a different time scale than other point in the day. It's probably likely that you might want to have carbohydrates with every meal but they don't have to be the fullest part of your meal. You should have some fat of some sort, protein, carbohydrates and each time you eat the 3 meals you have per day if you could have a little bit of all of them that's probably the healthiest thing to do. 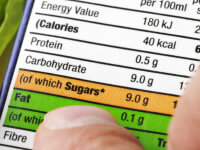 You also need to understand the nature of the carbohydrate and how quick it's going to absorb, but there's another demo on counting carbohydrates – but just to know that the carbohydrate is basically the bit that's going to give you the energy, well, the sugar in your diet because the body digests carbohydrate down into the sugars that they're made of. When it comes to diets high in protein, research has suggested negative effects including calcium excretion (which could lead to osteoporosis) and possible negative impact on kidney disease. Whilst some research studies show no signs of the effects, people who have developed, or are at higher risk of, these complications should discuss the possible effects of a high protein diet with their specialist before starting.